I made Jennifer’s boat neck top and LOVE it. I saw it and just knew I had to make it asap. First I had to go through some sewing machine difficulties, before getting into a good sewing place. I’ve finally decided that my machine will not shir–I tried everything. It does NOT like elastic in its bobbin case. So sad, because it caused me to say some really mean and harsh things to her. 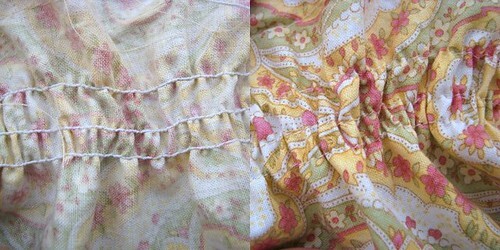 (I did make this little sundress last year, but had to hand pull the elastic thread to get it to gather~ a total pain!) This left me with no other choice than to have a sewing affair with my friend’s machine~an affair that may have to continue for a bit longer until I get shirring out of my system. Look! Shirred fabric! It was like magic~especially after adding some steam. I made a few alterations to the top, that now, I’m wishing I hadn’t. First, I don’t like things close to my neck (I hate turtlenecks!) and decided to make more of a downward curve around the neck, then went further and also cut a slit in the front. Now the slit keeps opening and that is irritating too.Maybe I’ll put a button on it to keep it closed. I don’t know…. Now I want to make Heather Ross’s Sundress and this Most Flattering Shirt Dress. I’m even looking at some of my old tops that could use some shirring. 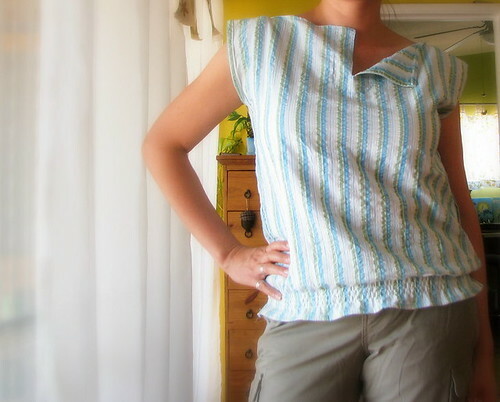 This entry was posted in Clothing, Sewing and tagged clothes, Sewing, shirring, shirt, top. Bookmark the permalink. Cute top! 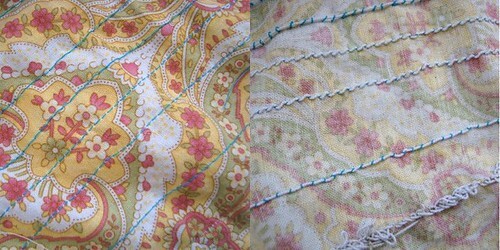 I am experimenting with shirring, too – making Heather Ross’ Sundress. For your top’s front slit (which I actually love as is), maybe another closure option is to make an inside liner for the placket area with some fusible interfacing and the same or complimentary fabric?